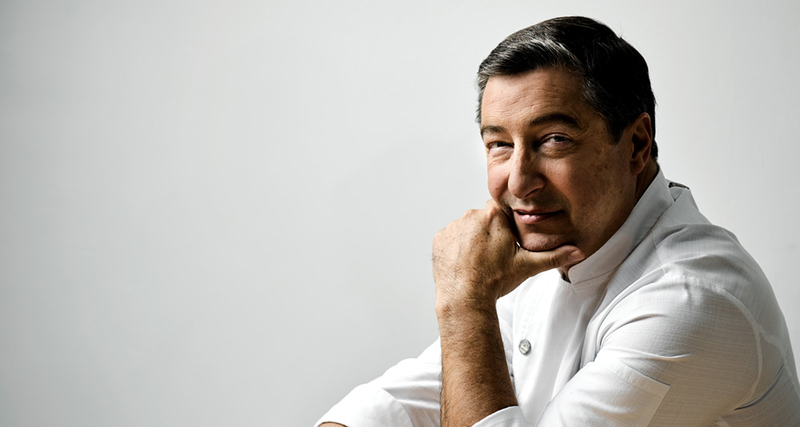 When Joan Roca decided to open a restaurant with his brothers, Josep and Jordi, he didn't have any grand ambitions. Growing up in his parents' modest bistro, Can Roca, it just seemed a natural thing for him to do. The brothers knew they didn't want to just take over their parents' business, but they didn't want to stray too far from home, either. They opened El Celler de Can Roca, a small place next door, in their working-class neighborhood on the outskirts of Girona, the medieval city in the Catalonia region of northeastern Spain. This was in 1986, long before the area became a mecca for foodies and a film location for Game of Thrones. Roca can't even recall the exact day the restaurant opened. "All I can remember is that it was late summer," he says. "It was small and cramped, and we used our mother's crockery. At the time, a restaurant guide named us 'the shabbiest gourmet restaurant in Spain'." In 1995, this "shabby" restaurant earned its first Michelin star. Its second came in 2002 and its third in 2009, the same year that Restaurant magazine included it in its prestigious ranking of the World's 50 Best Restaurants, in fifth place. It climbed to fourth in 2010, and came second in 2011 and 2012, before finally claiming the No. 1 spot in 2013 and again in 2015. How did a restaurant with such inauspicious beginnings become the best in the world? When it comes to achieving breakthrough innovation, what is the recipe for success? Restaurant kitchens have the reputation of being highly charged atmospheres, where profanities are shouted along with the orders, as food is quickly plated and dishes fly off the counter. Not so at El Celler. "We've never been like that," says Roca. "There has always been a calm atmosphere." This, he believes, is more conducive to the concentrated effort needed for creation. Keeping calm may have something to do with the training sessions the team holds every Tuesday, when the restaurant closes its doors at lunchtime so they can receive coaching from a specialist in the psychology of high-performance teams. While closing at lunchtime means losing the business of 50 paying customers -- representing more than 40,000 euros in lost revenue every month -- the benefits of these sessions are priceless, as he explains. "You have to understand that your customers are internal as well as external. So, all staff, including us, the bosses, are present. We talk to the team but, more important, we listen to what they have to say. We create an environment where any issue can be aired and addressed. We think together as a team. In this way, we protect ourselves from our own success." Running a large restaurant, as El Celler has become, is not the same as running a small family bistro: "When you're a small restaurant, with four or five employees, you can deal with issues as they arise. But when you have more than 75 people working for you, you need to take some time out, have a breather. Sometimes it's best to take two steps back before charging forward again, with a clearer mind and a freshened team." In addition to all the preparation, organization and training, Roca says "it's important to think carefully about the use of space -- in the kitchen, the flow of people and materials -- to make sure that everything is in the right place, so that your team can perform at its best." This is not as obvious as it seems: "In many restaurants, the kitchen is tucked away in a remote corner or in a basement, because some architect considered it inappropriate from the point of view of the customers. But that placement is not so good for actual cooking." This is one of the great changes that French nouvelle cuisine brought about. "The chef decided where and how the kitchen should be built, because it was his home." Another key ingredient for innovation is creativity, which Roca associates with nonconformity. "It's not just about cooking well. We encourage teams to constantly question things in order to find new ways to transform products and get the presentation right." El Celler dedicates thousands of hours to experimental research. In 2014, for example, 12,000 hours of research resulted in the introduction of 58 new dishes. This creative know-how has made El Celler an attractive partner for businesses in other fields. Corporate sponsorships, which the Rocas have agreed to sparingly, have led to several mutually enriching experiences. BBVA, for instance, invited members of the restaurant team to visit places where the global bank has operations and where there is a rich culinary tradition -- from Hong Kong and Turkey to Latin America and the southern United States. "We did three summer tours, traveling the world, cooking with local people, looking for and finding inspiration," says Roca. "We grew as individuals and forged stronger ties with each other, which helped make the whole team more cohesive. Traveling is one of those things that make you realize you still have a lot to learn." Going to a market in Bogota or Bangkok and discovering fruit you have never seen before is "an amazing learning experience," he says. The same goes for reading and speaking with local cooks and producers, "with people who know more about the land and the ingredients than you do." "When you know nothing and so you're forced to listen, it's very healthy. And this feeling of acknowledged ignorance -- at a time when people are calling you No. 1 in the world -- is a powerful driver of personal growth. It serves as a tool to 'attack' your success, and helps keep you active and alive." Besides researching, devising and preparing new dishes, restaurants such as El Celler have also transformed the way food is consumed. It's no longer the customer who chooses from the menu, but rather it's the menu's creators who guide the customer. "This is one of the great changes," says Roca. "Restaurants like ours are fortunate because the customer comes with an open mind, an adventurous spirit, and puts his or her trust in us." This freedom has enabled the kitchen to progress. Without it, "we wouldn't have come so far in terms of creativity, because we'd be restricted by what each customer orders on any given day. This eases product flows, since we already know what we're going to offer. It's more sustainable and less wasteful." Of course, this only works once you've achieved a certain status and people come looking for an experience -- and one that Roca doesn't consider inordinately expensive, since "the effort, the product and the human team behind it are extraordinary." The price of a meal with wine pairings ranges between 250 and 300 euros per person, somewhat less than in other world-class restaurants such as Osteria Francescana in Modena, Italy, or Eleven Madison Park in New York City. Although they could easily charge more, Roca insists on keeping it within the realms of possibility for local people. To preserve their freedom, the Roca family has embarked on a series of associated ventures: Espai Mas Marroch, Rocambolesc and, opening in 2019, Casa Cacao. These allow the family to generate additional income through catering, ice cream and chocolate ventures. They also publish best-selling cookbooks and have developed popular online cooking courses, or MOOCs. The latter is a demonstration of how they have been able to take "what we have always done and what we have always been committed to" and leveraged new technologies to share that knowledge more broadly. For Roca, opening up knowledge to others is crucial for two reasons: "It spurs your colleagues to evolve, but it is also a way of establishing your authorship and turning your accomplishments and knowledge into a shared heritage." As innovators collaborate, like many of the great chefs in Spain have done in recent years, that is how a field makes a collective progression.